When I saw this week's WPC 2011 subject of Colourful, I was really worried (details of what WPC 2011 is to be found here). I didn't really want to go running to my wool stash, because I take photos of yarn all the time. This challenge is supposed to be about stretching my abilities, so I wanted to try something different. The trouble is, in January in the UK everything is grey, grey, grey! I didn't know what to do, so I thought I would let my mind churn it over. Then today I went to the shop, to buy my lunch, and what should I find in a box by the door, but these little beauties. Aren't they fab? They were only £5, which seemed well worth the money, for the amount of colour they bring into my house. 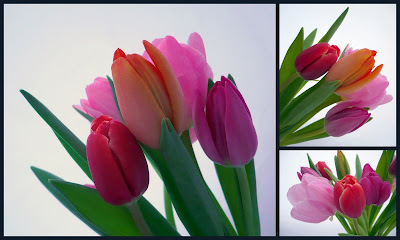 I took over 50 shots of these tulips and I tried using a flash, using the photo tent, without a flash, increasing exposure, changing ISO. I did lots. I was very proud of myself for trying so many different ideas. Most of them didn't work very well, but I tried. After much playing with cropping and fill light etc, I managed to winnow my selection down to three shots. I had forgotten how much fun it is to make collages with Picasa ;-) I am pretty happy with all three of these images. I took all three inside the photo light tent. I could never get such a clean background without it. I think it makes the photos look pretty professional, and means there is no distraction from the background. The photograph I decided to submit to the Group Pool is bottom right in the collage. It is interesting when I look at the settings for each of these photographs. The longest exposure was for the top right photo. I really loved this photo too, as I believe the colours are the cleanest and brightest. However in this image, and the large one on the left of the collage, I am not keen on the way the leaf cups the orange flower. It seems such a small thing, but it spoils both these images for me, despite having slightly stronger compositions than the one I submitted. The photograph I selected had 1/60 exposure time, ISO of 200 and normal sharpness. The white balance is set as cloudy. As you may guess from the details I'm including about the photograph, I still haven't read my new digital photography books. I will get to them this week.... I hope. This lack of research means I am probably listing NONSENSE!!! Even without knowing what I am doing, I feel that my photographs are getting better, if only because I am trying lots of different things with one particular item. I have to say, I'm really enjoying these weekly challenges. It's just as well really, I've got 48 more to do!